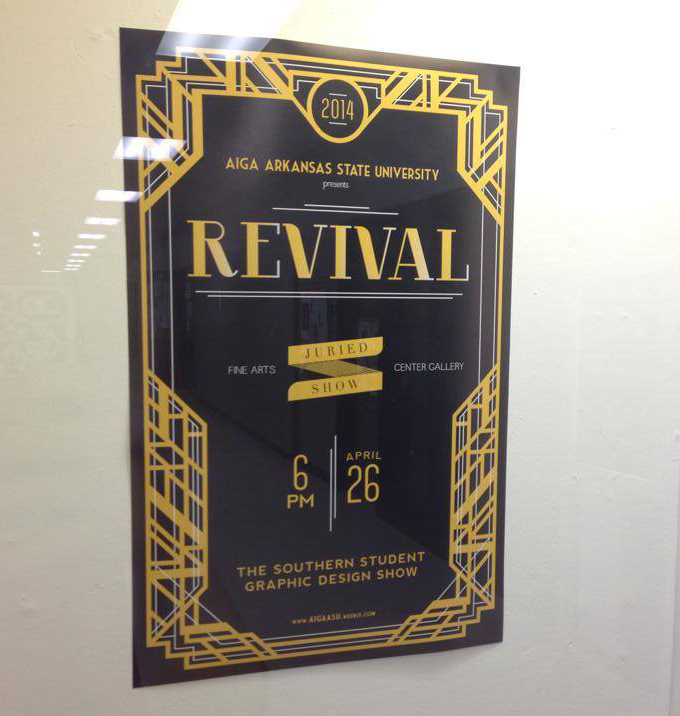 I felt honored to be invited by the Arkansas State University AIGA to be a speaker for their student show – Revival! The show was impressive and it was fun to see the ASU campus again. This is a competitive juried show for graphic design students in Arkansas, Kentucky, Mississippi, Missouri, and Tennessee. The jurors are respected professionals from across the country who each have an educational tie to the Delta region. The chosen student winners will be on display in Arkansas State University’s Fine Arts Gallery. The award ceremony will be on opening night, Saturday, April 26th from 6:00pm to 10:00pm. The guest speakers will be starting their presentations at 7:00pm, followed by the announcement of the winners and their prizes. 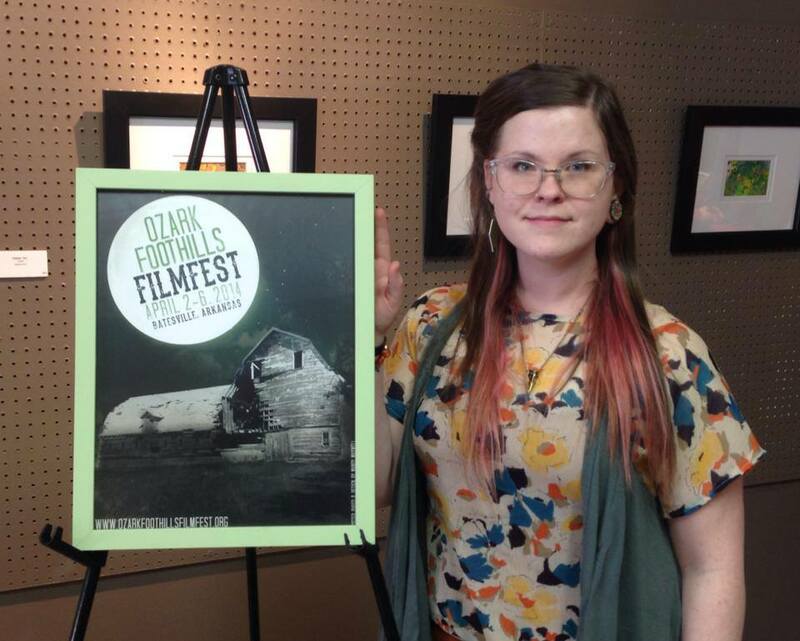 This year I was lucky enough to do the branding for the 2014 Ozark Foothills FilmFest. The barn picture used was taken by me in Minnesota; originally a daytime picture, it was digitally altered to be illuminated by the moon. Me at the official poster unveiling. Exciting news! I will be having an art exhibition of my 45RPM works this weekend with the screening of 45RPM the movie at The Arts@311 in Jonesboro. This is a special one day event – DON’T MISS IT! The Arts@311 is located in downtown Jonesboro. More info at the Facebook event. 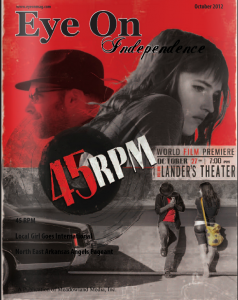 My work for the indie film, 45RPM, was featured on the cover of Eye on Independence Magazine for Independence Co. Arkansas. There is also an article and interview with director, Juli Jackson, with more artwork inside. I have lots and lots more artwork to add from the 45RPM project, and will as soon as I can. Hope to see you out for the premiere in a couple of weeks! I was thrilled to be a part of this year’s Ozark Foothills FilmFest. It all started with the poster and from there grew the entire look of this years fest. I am so glad Bob and Judy Pest, the entire FilmFest staff, let me have such a big part of the branding. I think it turned out very interesting and intriguing. Lots of good words were said about during the Fest so I was very honored. I know Ben and I will definitely be attending this event for years to come. Thanks so much to the Batesville Arts Council Gallery for the lovely reception for my art gallery opening last Friday. There was a great turnout! It was such an honor to have so many people viewing my work at once. Afterwards, a lot of us ate at the delicious Elizabeth’s across the street — so good! Batesville is starting to feel like home as much as I’ve been there the past couple of months. Can’t wait for the film fest! 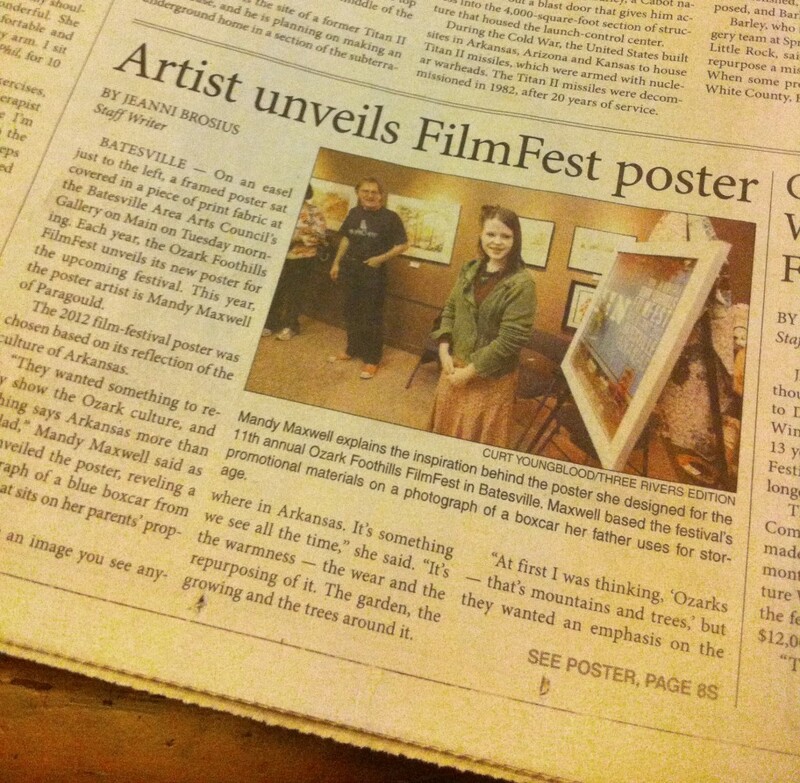 I was featured in the Arkansas Democrat Gazette – 3 Rivers – on Sunday, February 26th as the artist for this years Ozark Foothills FilmFest poster. Ozark Foothills Film Fest Unveiling Reminder: Tomorrow! 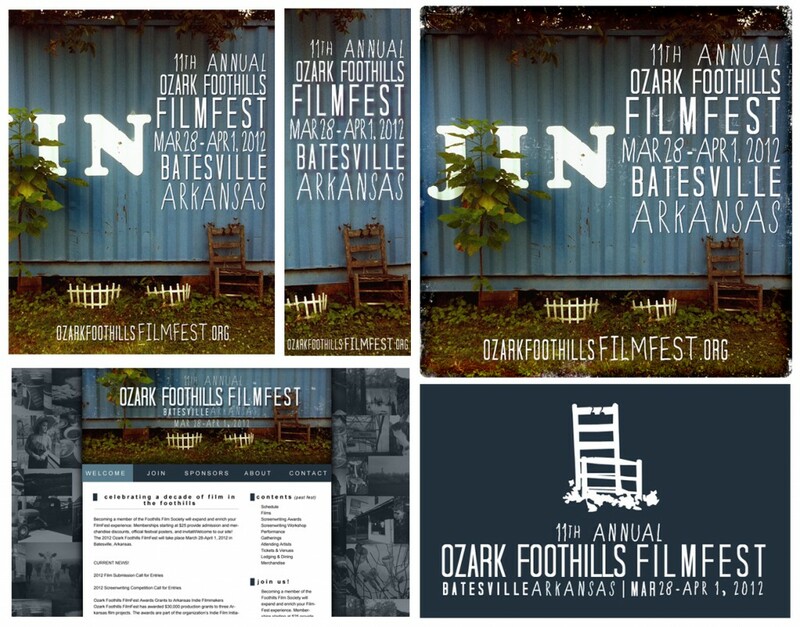 Today the official branding I did for the 2012 Ozark Foothills Filmfest went live, you can see it on their website here. The website features the photograph from the poster, and various other background images taken by me. The poster and t-shirt I designed are also featured on the site. Tomorrow, February 21st, I will be in Batesville, AR for the poster unveiling and press announcement. Hope To see you out! Hello, Friends of the Fest. Just a reminder that this Tuesday, February 21, is the FilmFest schedule release and poster unveiling. It takes place at 11:00 am at the Batesville Area Arts Council Gallery. 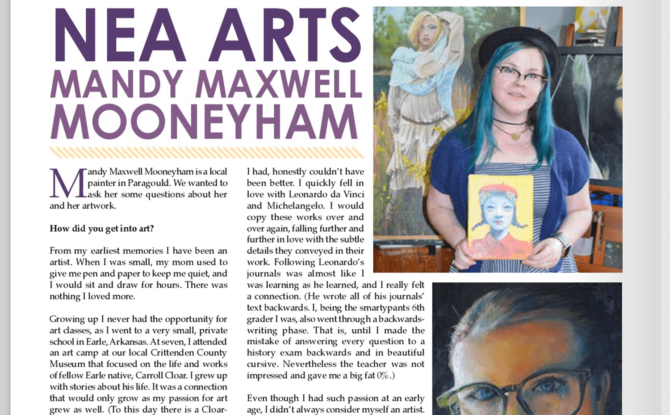 This year’s branding artist, Mandy Maxwell from Paragould, will attend. In addition to providing the original photograph used in this year’s official poster, Mandy also did or helped with all the pieces of this year’s branding campaign, including the website, program cover, and t-shirt. She’s spent countless hours working on our behalf; we’re hoping for a good crowd to reward her efforts. For those of you who have purchased or indicated that you plan to purchase a Foothills Film Society membership, I will bring most of the members’ posters to the unveiling so that Mandy can sign them, if you’d like her to. The Batesville Area Art Council Gallery is located at 246 E. Main St. in Batesville, AR. 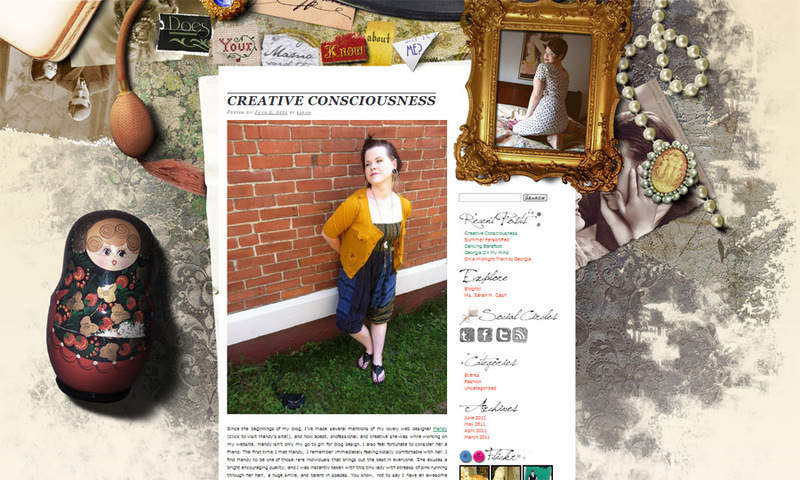 I was honored to be featured in Miss Sarah C.’s style blog. Sarah is a girl I only knew for a short time, but made a lifetime impression. Her posts are some of the most well-written and beautiful articles you’ll ever read. I love following along, and seeing all her gorgeous dresses. Every shadow and drop shadow was digitally painted using techniques of chiaroscuro, and keeping in mind the size, texture and height of the object. 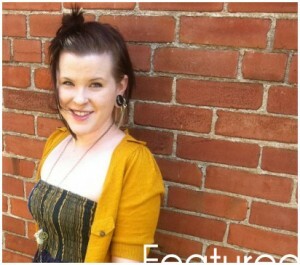 The background is a mix of 5 or more photos and textures. Every object was purposely selected to match Miss Sarah’s personality and interests. Each of the papers that make the title Does Your Mama Know About Me were 100% created by me to look like logos, book pieces, coffee cups shards, and more. This was done as a study in fonts. I chose a font and then created a background I thought was fitting. All together I love the total look. It was both a challenge and an honor to create. Be sure to follow her! 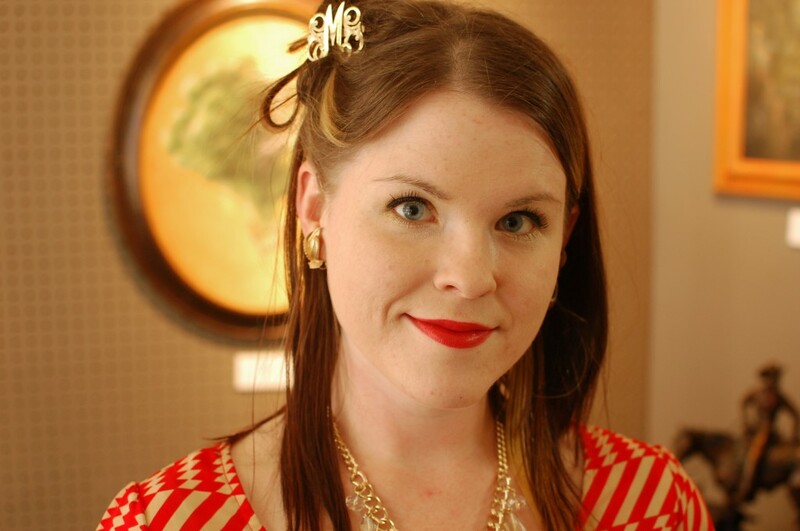 See the latest Mandy Maxwell Mooneyham commissions as well as inquire about your own. M. Maxwell - Artist of 45RPM.